Say YES! to new Adventures. I loved it so much I extended my research trip twice! Inspired by the smiles, I arrived home more in love with life, so excited to share this with you. Are you ready to say Yes! to a new Adventure? We spend most of our time in an eco-lodge located on a small island 36kms from Dili, capital of Timor-Leste. The last night is in a hotel in Dili overlooking the bay. Who are Karen and Jo? Karen Willis (that’s me) is the co-founder of Sharing Bali and has been running healthy retreats in a small village in Bali for nearly 10 years. An ex-fashion industry player and wanna-be writer, Karen calls Bali home. Sharing Bali & Beyond is Karen’s newest venture and it’s captured her heart. Jo Sharp our resident fitness wellness guru will be on hand to rejuvenate your body and mind with pilates, yoga and some awesome core strengthening adapted to our beach location. Jo is also available for private wellness coaching sessions. Read the story of how Jo and Karen met in Bali. It was fate! Think: Morning walks to catch the sunrise, hiking, snorkeling, swimming, boating, exploring local villages & community co-ops, along with time out to relax in your beachside hut. Jo will create just the right blend of Pilates/Yoga/Core sessions for us. We’ll be on the beach or under the trees. Expect the staff and locals to join in. Day 1: Meet at Dili hotel (any time after 12 noon). Relax. Have some pool time. We chat about the program over dinner. Day 2: Early morning boat to the island. We stop along the way if we see some whales. Settle into our bamboo bungalows on the beach. It’s a day of snorkeling, hammock time and a session with Jo. Get on island time. Day 3: Early start to hike across the island. Swim. Eat. Relax. Jump on board an outrigger boat home. The afternoon is for hammock time and massages before a late afternoon session with Jo. Day 4: Tuk Tuk ride to start point of mountain climb. Take in the views, be inspired by the day, descend. Afternoon naps, massages and refreshing dips are on! Stretch out and release your muscles in a session with Jo. It’s a big day, we celebrate with a cocktail at sunset. Day 5: Start the day with a sunrise walk. There’s time for a final workout after breakfast. Its market day – free time to explore and have lunch local style. Late afternoon local ferry to Dili. Time to chill and reflect on our island time over drinks and dinner at the hotel. Day 6: Climb the 500 steps to catch the sunrise at the famous Christo Rei statue. We say goodbye over breakfast. 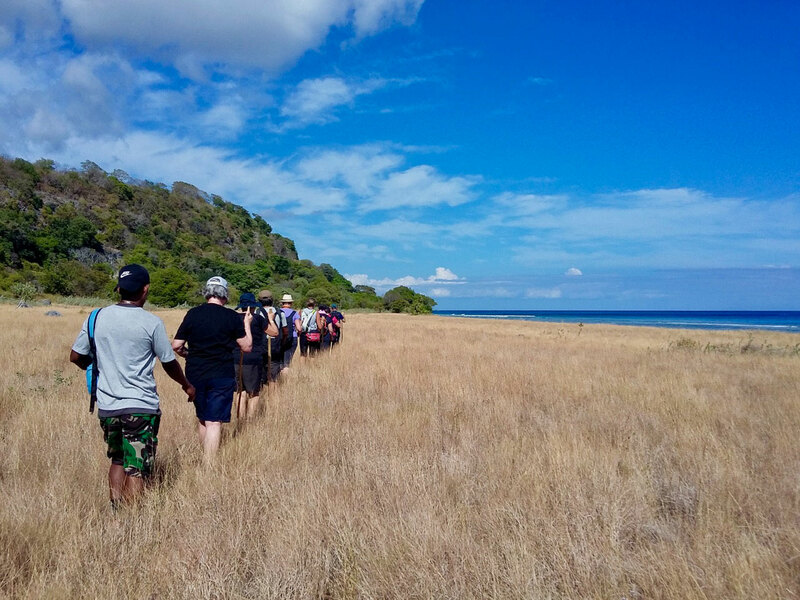 The day is yours to explore Dili or move on to the airport or your next destination. * Breakfast, lunch and dinner is worked into the daily program! ** The mountain climb is a challenge. We can assess if it’s for you. Don’t worry, you can do a sunrise walk, snorkel, or if we have enough people do a session with Jo as an alternative. *** We work in visits to local womens co-ops to see local arts and crafts in between activities. It’s easy to plan day by day. **** We stay flexible and take local advice as weather and sea conditions change daily. Leave the details to us to worry about… you get to let each day unfold. Can you tell me more about the hikes? The hike across the island is a beautiful 4hr walk taking us to a village located on a magnificent stretch of beach. Diving into the calm turquoise waters at the end of the hike is pure bliss. We walk on dirt roads, rocky paths and flat coastal tracks. It’s steep in places, so we get a little sweat up but it’s all worth it. It’s not a race. We have time to chill, eat, hang out on the beach with local fishermen before boarding our outrigger boat. We hug the coastline, taking in the breath-taking views underwater and all around us. This is a land less travelled. The beauty is astounding. On my research trip, I felt like the luckiest person on the planet skimming across those waters in a simple boat heading ‘home” to my bungalow on the beach. So incredibly grateful for every single moment. The hike on the highest mountain (999m) will challenge you and reward you. Get ready to work out your quads and glutes. Our breaks to take in the views are well deserved and the forest at the top gives cool relief. We’re rewarded with stunning views over the island and across to Indonesia. We get home in time for a dip in the ocean before lunch. Afternoon naps are on! You can’t bring back the past, and you’re not promised the future, so enjoy life NOW. Ok I’m in. What do I do next? What about snorkelling and swimming? Take a dip in the turquoise waters right outside your hut. It’s safe. No nasties such as jellyfish or crocs to worry about. It’s a less than five-minute boat ride out to the reef for superb snorkeling. The reef is protected. Feel good knowing that your snorkeling trip is funding further conservation and research. Is there time to do stuff by myself or add in extra activities? SB&B trips are active. You don’t need to be the fittest or the fastest, but you do need to be active, free of injuries that reduce your mobility, and at a minimum, have the ability to walk a hilly 5km track unassisted. The mountain climb may not be for you if you have injuries or are unsure about your fitness. There is no joy in putting yourself under stress. You can either sleep in and take a leisurely swim or take an early morning walk outside the village to catch the sunrise. Our hosts have created an eco-lodge with individual, simple bamboo bungalows surrounded by permaculture gardens. Crystal clear turquoise waters are just metres away. The local village and market easy walking distance. Sustainable practices are at work – solar power, water recycling, minimal use of energy. There’s no need for AC. The use of grass roofs, latticed windows and ceiling fans create breezy well ventilated spaces. Your hammock beckons you to take a rest. Bathrooms are shared, bathing “mandi style” with cool fresh water is perfect. The toilets are self-composting. Worried? Don’t be. They are beautifully clean and you will adapt in no time. There are limited cabins. They all have different configurations. Only a couple of singles. The share cabins are spacious, sometimes with a wall between beds or an upstairs loft making it very easy to share. We ask friends/family to share, occasionally we ask singles to share. We often share the lodge with marine biologists and dive volunteers working on marine and community projects for the island. This Is Simple Luxury, your chance to get off the grid, meet wonderful people, experience the wonder of nature, learn so much and have time for YOU. Simple Luxury….. it changes the way you see life. I need this in my life. Tell me more. Get yourself to Dili, the capital of Timor Leste, and everything else is done for you. The airport is more shed than terminal, but the fragrant flowers and tropical air as you walk across the tarmac make up for it. Take a taxi to our Dili hotel Check the AIRNORTH schedule for direct Dili flights. We eat in a communal dining area at set times. A variety of dishes are served buffet style each meal. Fresh fish is served daily with a range of vegetables and usually a chicken dish. Fresh food isn’t exactly abundant on the island, some of our food is brought in from Dili. We join in the hustle of the weekly market for lunch on our last day. Fresh fish are cooked over coals right next to the table. Help yourself to tea, coffee and water all day. Beer, coconuts and soft drinks is on an honour system. Write down what you drink, pay when you leave. There’s a fridge for our personal use in the dining area. We enjoy meal times, happy to be so well provided for in such an environment. You will meet many interesting people over dinner. Everyone has a story. Take the time to chat. It’s HOT. Tropical HOT. We plan our days around the cool mornings, avoiding the heat later in the day. Afternoons are best spent napping, reading, drinking or taking refreshing dips in the ocean. It’s nice to get moving again around 5.30pm. Perfect for a workout with Jo. The evenings are pleasant. It’s so important to drink lots of water and use sunscreen, and to cover up from the sun. Heat exhaustion is not fun, but it can be avoided. Pack your refillable water bottles. Min 6. Around 12 max. There will be other guests at the property. People from around the world are drawn there to enjoy, learn about and give back to the island. Expect to make friends and exchange ideas with marine biologists, NGO workers, volunteers and like-minded travellers. I have never travelled to a developing country. Will there be a big culture shock? What do I need to know? Our hosts actively contribute to improving life on the island by providing assistance which builds on the richness and strength of peoples’ way of life, without creating a mentality of welfare and dependency. It is all about R.E.S.P.E.C.T. and you can play your part. Please take the time to read the guidelines at the end of this page that will help you be at one with the community and the environment. Are there good arts and crafts to buy? Yes! My laptop has never looked so good since my island visit. I tote it around in my new embroidered (on a pedal-powered sewing machine) bag. The turquoise takes me right back to those crystal-clear waters. Bought from a womens co-op it puts a smile on my face. Many foundations exist throughout Timor Leste to support traditional arts and crafts in an ethical way. Everything from hand woven cloths, finely woven baskets, sculpted figurines to wooden diving goggles. Buy them at co-ops and markets. Best of all, you get to go home with wonderful treasures, knowing you have supported the local communities. Leave some space in your bag! Do good. Be good. Simple. You are ready to say YES! to new adventures. You want an active outdoor holiday in an exciting new location. You have a sense of wonder and curiosity. You embrace everything about travel… new cultures, places, food, customs and friends. You are ready to be part of a small group… sharing, supporting and having a good time. You are excited by the concept of Simple Luxury. You need resorts and night life with 24/7 services. The trip will put your body under stress due to your medical conditions. It’s not worth it. Recover, then join us when you’re feeling good. You don’t like places where English is not the main language. You only eat the same food wherever you go in the world. Flexible schedules make you crazy. You don’t like amazing snorkelling, hiking, natural unspoilt beauty and friendly people.. Worried about the communal aspect? You can choose to have time in your hammock, reading, writing, chilling. The nights are calm, quiet. Everyone respects personal space. Every activity is optional. Be as active (or not) as you like. Your choice. Wish you were waking up to this? YES! How do I book? With good reason. Timor-Leste has emerged from troubled times, infrastructure is not what we’re used to and tourism is new. I travelled solo on my research trip and felt very safe. Once on the island, same as my Bali village, I left my door unlocked and was greeted with big smiles wherever I went. I exercised caution in Dili and felt very OK. Head to the FAQ page for my personal safety tips. I have a belief that you can find trouble anywhere in the world if you go looking for it, so make your choice. Sharing Bali & Beyond is all about making connections with local people who care enough to share their world with us. Our hosts, guides and drivers are trusted, friendly and all round good people who deserve to be treated well. Any WiFi? How do I stay in touch with family? This is your chance to take a break from 24/7 connectivity. No WiFi. Best to stay in touch via SMS. Internet access is slow and random. Buy a local sim card and data package at the airport if you really need to, or use my phone to send SMS anytime. Just like Sharing Bali, let’s keep the dining table free of Facebook, Instagram, work emails etc. Enjoy your food, enjoy the company around the table. Travel light! You need very little. I travelled with 5.5kgs check in and had excess stuff. Check off everything on my good to go list on the itinerary and you’ll be ok. Bags are piled into small holds in the fast boat and we carry our own bags across the beach for 200m when we leave, so backpacks or soft travel bags work best. Do leave room for some extra treasures. I travelled home with 7.5kgs and a new basket! Leave the expectations at home, pack your sense of wonder and curiosity. PS. I like to have a couple of surprises… not giving it all away here. You need to be there! This includes a $25pp contribution to community projects run by our hosts. We ask for a non-refundable deposit of $AUD600pp to secure your place. The final payment must be paid 60 days prior to departure. An online invoice will be sent to you. Payment is via direct bank transfer only. What are the terms and conditions? What if I need to cancel? Travel Insurance is mandatory for all of our guests. Please read the fine print. You need to be covered for medevac by plane. Please confirm any special dietary needs before booking. Please note that for reasons of safety we cannot take guests who have a fatal allergy to any food/food groups. We are not liable for personal injury, death, damage to property or other loss whether arising from accident, cancellations, delays or any other matter beyond our control. Participants should insure against all such possibilities. All participants participate at their own risk. We reserve the right to refuse to take clients on any of our hikes/activities if we consider that their health/injuries are likely to present a risk to themselves and others in the group. Please respect our experience and acknowledge that your health and happiness is our priority. We retain the right to change the program to suit weather conditions. Unexpected things happen. We know that. Life doesn’t go to plan and then you need to cancel. The best way to cover for the unexpected is to take out travel insurance as soon as you pay your deposit or buy your plane ticket. Your $AUD600 deposit is 100% non-refundable. All payments are 100% non-refundable once we hit 60 days prior to arrival. Please understand that we can’t take out insurance against you cancelling on us, so we expect you to do the right thing and cover yourself. Buy your insurance as soon as you book a flight or pay your deposit. We will be incurring expenses and spending time on your behalf once you pay your deposit, so please don’t ask for a refund, it creates great heartache. Check that someone can look after the family, the dog, cover you at work, water the garden or whatever else you need to be able to enjoy a guilt free experience of a lifetime. Book once you are excited, committed and ready to pay! Hit the FAQ page or drop me an email any time. Fill in your pre-trip details here. I’ll be in touch with everything you need to book your bean bag on this boat to start your new adventure in Timor-Leste. We have been welcomed with open arms and big smiles to an island that is new to tourism. A little respect goes a long way. Our hosts have some good tips, listen up…. Restrict swimwear and brief clothing to beaches outside the main village centres. Sarongs and tshirts are good cover ups. Be aware that explicit displays of affection in public places are offensive. Refrain from giving sweets or money to kids. This only encourages begging and makes it hard for future visitors. Enjoy the beauty of the reef without touching, damaging or removing coral, shells etc. Minimise your rubbish and dispose of in bins provided. Water is scarce. Power is solar generated. Be mindful of what you’re using. My personal tips…. let’s not bring what we all don’t like about Bali to this untouched island. You know what I mean…. No short shorts and singlets please. Best to leave the revealing active wear at home. Bring old comfy gear that you don’t mind getting wet and salty. I take an extra sarong wherever I go. Perfect cover up and keeps the sun away. Most people don’t mind having their photo taken, the kids will jump in for a selfie, but do ask first. Dress nicely for the plane trip. No need to go over the top, just remember that immigration and customs is seen as a formal process. Be friendly. Language is no barrier. Everyone smiles in the same language. Everything you do makes a difference… so do your best. Or put your own group together and we’ll work on some dates for you. I’m in. How do I book?